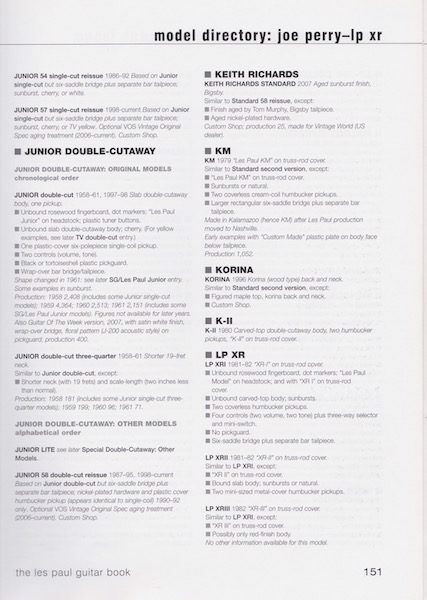 Here are the first four entries from the reference section in The Les Paul Guitar Book of 2009, and below that a sample page from a bit further on. There are just over 100 entries, ranging from relatively short single-variant ones to much longer multi-variant entries (for important models like the Custom, Standard, Junior, and so on). The examples here should at least give you an idea of the amount of info I’ve condensed into the format I use generally for the reference sections in all my books. ACE FREHLEY 1997–2000 Three white-coil pickups, Ace Frehley graphic on headstock. • Lightning-bolt markers; signature inlaid at 12th fret; Ace playing-card on truss-rod cover (chrome for Custom Shop run; black plastic for production version); Frehley face on headstock. • Bound carved-top body; flamed maple top cap; cherry sunburst. • Three coverless pickups with white coils. • Four controls (two volume, two tone) plus three-way selector. – Custom Shop version (1997), production 300, numbered with ACE prefix; USA factory version (1997–2000) numbered with regular eight-digit serial. ACOUSTIC 2001–05 No visible pickups, acoustic-style pin bridge, figured top. • Bound rosewood fingerboard; crown markers, pearl “Gibson” logo on headstock, plastic tuner buttons. • Bound carved-top body; figured maple top; trans blue, trans black, or tangerineburst. • Electronics from Gibson Chet Atkins SST model, piezo pickup. • Two controls (volume, tone) mounted on rim. • Rosewood bridge with bridge pins. ARTISAN 1976–82 Ornate fingerboard markers. • Bound ebony fingerboard, ornate markers; script Gibson logo and ornate inlay on headstock; “Artisan” on truss-rod cover. • Bound carved-top body; sunburst, brown, black, or white. • Two or three metal-cover humbucker pickups. • Black laminated plastic pickguard. • Six-saddle bridge plus separate bar tailpiece (some with six fine-tuning knobs). – Some without fine-tuners on tailpiece. – Production: 1976 2; 1977 1,469; 1978 641; 1979 108. Figures not available for 80s. ARTIST 1979–81 Block fingerboard markers, “LP” headstock inlay, three controls and three mini-switches. • Bound ebony fingerboard, block markers; “LP” inlay on headstock; metal truss-rod cover; brass nut. • Bound carved-top body; sunbursts or black. • Two metal-cover humbucker pickups. • Three controls (volume, bass, treble) plus three-way selector, three mini-switches (brightness, expansion, compression); active circuit. • Six-saddle bridge plus separate bar tailpiece with six fine-tuning knobs. – Also known as Active model. – Production: 1979 234. Figures not available for 1980 and 1981.